Please share with anyone who might want to work in New Hampshire, Vermont or in 40 other states – supporting environmental and conservation efforts (includes office and outside positions). The USDA Forest Service is currently hiring for Full-Time Permanent, Seasonal (summer), and Internship positions. To qualify, you must be a US Citizen, 18 years old and older, and eligible for Federal employment. Some positions may require a driver’s license. Special consideration given to Veterans, persons with a disability, and to students and recent graduates applying under the Federal Pathways to Employment Program (enrolled in college, trade-school, certificate programs, etc; or graduated within the last 2-years from high school, a GED program, college, trade-school, certificate program, etc.). Contact Jessie Scott at JLScott@fs.fed.us or 617-548-2546 for more information. Pay levels will be based on previous work experience, education, and training, as required by Federal Guidelines. Trail Crew: Performs maintenance and construction/reconstruction on foot trails and bridges that form part of the 1,200 miles of footpaths on the WMNF. Backcountry Ranger: Performs maintenance of back-country shelters, cabins, and campsites, and makes visitor contacts promoting Leave-No-Trace principles. Developed Recreation Staff: Performs maintenance and operational support at developed recreation sites, such as campgrounds and trailheads, across the Forest. Visitor Information Services: Provide services directly to the visiting public through face-to-face contact and telephone at one of our four information centers. Timber Stand Improvement Crew: Performs brush saw/chainsaw removal of non-commercial trees, collects seedling and tree data, and marks timber for harvest. Construction & Maintenance Crew: Work as a la-borer or equipment operator (CDL required) on road projects across the Forest. Archaeologist: Conducts field surveys for historical and archaeologist resources in support of ongoing projects. Biological Technician: Conducts field surveys of wild-life , birds, fisheries and eradicates invasive plants. Fire Technician: Part of a fire/fuels crew preparing burn units, prescribed fire, and part of an organized crew fighting wildland fire. Positions will be stationed at administrative sites in Bartlett, Gorham, Conway, and Campton NH. Typical duties include but are not limited to; stocking brook trout, Management Indicator Species surveys, stream and pond habitat surveys, participating in prescribed fires, apple tree release, wildlife opening maintenance/mowing, fisheries population surveys, and stream habitat improvement projects. We anticipate offering Biological Aid/ Technician positions at the GS-3, 4, and 5 levels on both the Rochester and Manchester Ranger Districts with Government housing likely to be available on the Manchester Ranger District. Typical duties include clearing fallen trees and campground maintenance activities. Checks for compliance with regulations, issues notices for common violations, and reports other violations to supervisor. Assures recreation area and trails are maintained in accordance with standards. Constructs and rehabilitates minor recreation facilities and trails. Makes safely checks of public use areas and takes corrective action. We anticipate offering Forestry Aid/ Technician positions at the GS-3, 4, and 5 levels on both the Hector and Manchester Ranger Districts with Government housing likely to be available on the Manchester Ranger District. Takes and or records basic measurements such as compass readings, distance measurements, tree heights, tree diameters, tree growth, and determines common species. Receives training on marking trees for cutting using tools such as Spiegel Relaskop, clinometer, compass, chain, diameter tape, increment borer, electronic field data recorder, etc. Selects and marks individual trees for harvest using well defined marking guidelines, silvicultural prescriptions, and specific instruction. We anticipate offering Forestry Aid/ Technician positions at the GS-3, 4, or 5 levels on the Manchester Ranger District with Government housing likely to be available. Here a re a few links to guides I have compiled with you and my previous grad students. I hope that they make your life easier! Article Summary Form – Not sure how to summarize the key bits of an article? Feeling intimidated about compiling your personal annotated bibliography? Use this form to get the boulder rolling. Best Ways To Accomplish a Lit Search – A couple sensible guidelines about shrinking your blind spots while performing a lit search. Course of Study Template – A couple remarks that my graduate students have supplied concerning classes to take as a grad student. Detailed Outline Format for Theses – This document serves like a little template. Use it, or the one supplied by the grad school. Example Poster Abstracts – Headed to a conference? You might refer to this if you’re stumped about drafting your abstract. Gaining Entrance Into Closed Groups – Is your research project about a sensitive social topic? Take a look here as a jumping-off point to more detailed discussions in your textbooks. How To Read Articles – Another take on getting what you need out of an article without grinding to a halt. Milestones to Graduation – This guide is outdated–visit our Google Docs version instead. On-Campus Assistantships – Searching for funding support? More than one of my grad students has been able to take advantage of these. Presidential Management Fellowship Checklist – The PMF program is highly prestigious and the application is not trivial. Here’s a short guide we compiled to help ourselves for next time. Survey Editing Template – This guide is a short jumping-off point to the more detailed survey/questionnaire instrument editing checklist in Vaske’s textbook. 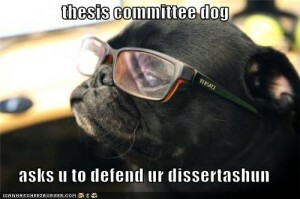 Surviving Grad School in the PARCS Research Group – This list collects the survival strategies of your fellow research grad students. How to manage Dr. Park! How to stay sane! Why you always inspect data visually – Once you’ve collected data, read this. It will sober you up. Environmental Ed Tool Tested For Effectiveness. Laura Baird and I just completed a presentation about helping kids to Leave No Trace effectively (and enjoy it!) for Keep America Beautiful‘s 2014 conference in Charlotte, NC. Here’s the PowerPoint file and a .pdf version. Laura also put together a handout to illustrate some of what we talked about. Finally, I was able to capture part of the session as an audio recording (very soft, turn your volume up; also a huge file). The whole point is to let nerdy researchers like me make the life of not-for-profit executive directors a little easier through research and avoid having to reinvent the wheel. Statistics don’t move or motivate us [or grant funding sources], stories do. Statistics are required and ubiquitous after funding is secured. Marinas and small businesses concentrate butts at the land/water interface. · Fatalities receive less press, if any, but draw hundreds of workers in “class A’s” (dress parade uniform). Visitors don’t hang out in downtowns where locals won’t hang out. An anchor tenant is the place you go out of your way to visit.